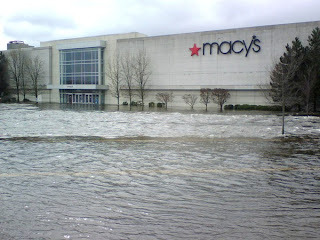 Macy's in Warwick, March 31, 2010. We're coming up on the one-year anniversary of the Rhode Island spring floods that made national news. It's been a long year of recovery - just last week, Macy's re-opened at the Warwick Mall, which was devastated by the unprecedented flooding. To mark this bleak anniversary, WSBE Rhode Island PBS presents the encore of Hometown Flood on Saturday night, April 2 at 7 p.m.
Last year, at the height of the catastrophe, Chris Walsh combined his fascination with weather and film making, and began recording images and interviews that would later become a compelling documentary. Hometown Flood visits Westerly, Rhode Island, neighbors and businesses, local and state officials, and stunning footage captured at the height of the raging waters. Chris also re-visits some of the same people and locations three months later. Hometown Flood tells a compelling story that will make you want to laugh and cry, cringe and cheer, as it celebrates the indomitable spirit of Rhode Islanders. We discussed the film in a previous blog, complete with video clips.